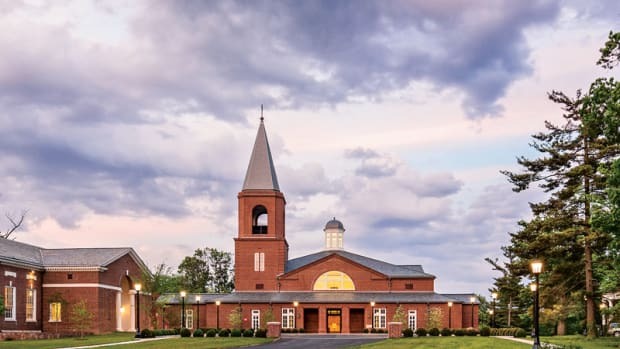 Glavé & Holmes Architecture builds Christopher Newport Hall and nabs the Palladio Award for New Design and Construction, More Than 30,000 sq.ft. Christopher Newport University, a small, public liberal arts institution in Newport News, VA, takes great pride in the fact that it has always lived up to its motto: Students Come First. In 2015, its 54th year, it writ those words large in cast stone and red brick with the opening of Christopher Newport Hall, a one-stop student success/services structure that ushers scholars from admissions to graduation and serves as the cornerstone of the University’s two-decades-long transformation into a world-class campus. The $32-million, 82,000-sq.ft. 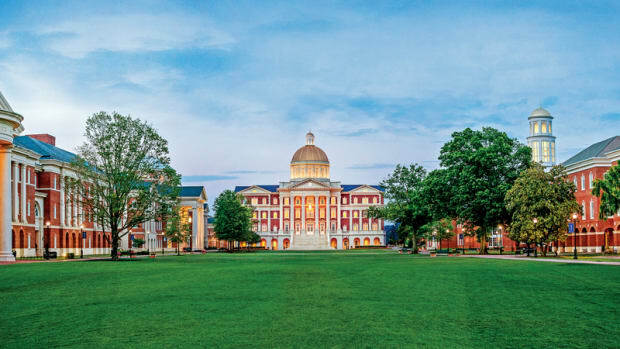 Neoclassical Collegiate-style edifice, the work of Glavé & Holmes Architecture of Richmond, VA, marks the culmination of the institution’s grand master plan to create an iconic Great Lawn that functions as the head and heart of the campus. The completion of the stately drum and domed monument is a milestone for Christopher Newport University, a college freshman among the commonwealth’s celebrated centuries-old institutions of higher learning. 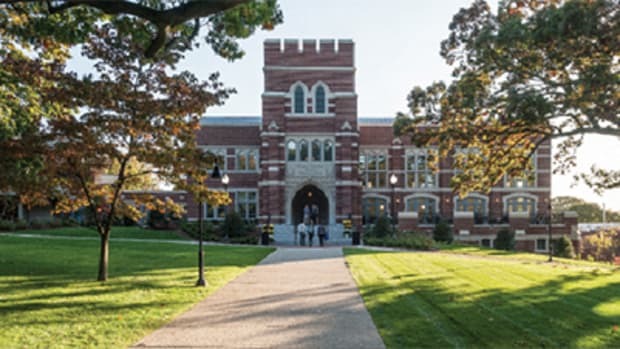 It replaces a four-level 1980s brick slab and ribbon-windowed modernist building that was functionally obsolete and aesthetically out of sync with the traditional Ivy League theme. When it opened its doors to scholars in 1961, the school was a mere extension of the College of William & Mary. Although it would gain its independence in 1977, it would not achieve university status until 1992 and would not seek to make an architectural statement until 1996 under President Paul S. Trible. During the last decade, Glavé & Holmes has designed a number of campus buildings, most notably the nearby Forbes Science Building and Luter Hall, which houses the Luter School of Business. It also expanded the Freeman Center that sits adjacent to Christopher Newport Hall. To assure that the hall best serves the 5,100 students on campus, the firm reached out from the past to the present and into the future, creating a design that fluently speaks the hierarchical architectural language of the Neoclassical Collegiate style yet fuses it with a contemporary idiom that places a value on natural light and air, sustainability and spaces that work for students and staff. The classical orders were executed in precast using 21st-century technology. As with all recent buildings on the state-owned campus, Christopher Newport Hall’s design addresses sustainability and energy-efficiency goals. The building meets Virginia Energy Conservation and Environmental Standards, a state-approved alternative to LEED certification. The first floor, which houses a student Commons, is in the Tuscan style; the second floor, the reception area and starting point of campus tours for prospective students and parents, is in the Doric order; the third floor, where student services offices are located, is Ionic; and the fourth floor, where the president’s office and other administrative offices are sited, represents the Corinthian style. Christopher Newport Hall’s crowning touch – the shimmering painted metal dome – is a triumph not only on the outside but also on the inside. As originally envisioned, the sightline was to soar from the second floor to the oculus 110 feet above, but the costly atrium fire-exhaust systems required by state safety codes spurred the team to think outside the dome. The solution – a circular 15-ft.-dia. fire-rated structural glass/privacy glass floor that looks like a mullioned window – was unprecedented. “When it was under design, no other place in America had one,” Garrett says. “Now, there’s one at Northwestern University’s Engineering Life Sciences building. We had wanted to have a single piece of glass, but it wasn’t possible technologically, so we divided it into the biggest segments possible.” The floor, which is visible from the second and third stories, contains a layer of transparent LCD glass, which at the flick of an electric switch, becomes translucent to provide privacy when the space is used for receptions. “Desperation drove the design,” Holmes says. “The president, in keeping with the university’s student-focused philosophy, wanted the view of the dome to be open to everyone, not just staff members with offices on the top floor. 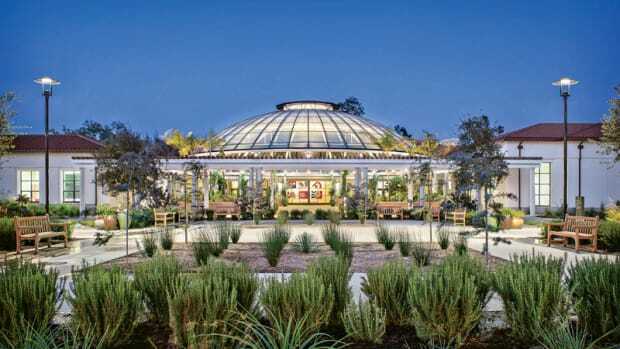 We also designed it so that you can walk around the dome’s balcony; the 360-degree views of the Great Lawn are fantastic.” The glass floor is the most popular feature of the hall, with students continually bringing family and friends onto the fourth floor to ask for demonstrations of the transparent-to-translucent feature. The furnishings in the hall are traditional, Garrett says, “because the university believes that creating beautiful, traditional spaces generates respect.” The red-blue-yellow-white color scheme is classic and timeless. Red, a vibrant, high-energy color, is used on the first floor, where students congregate. The upper three floors are enveloped in various shades of cream with red, blue and yellow accents in the soft furnishings. The importance of Christopher Newport Hall to the university’s culture has far exceeded everyone’s expectations. Some students who tossed their tasseled caps into the air at graduation have returned to its iconic staircase to exchange marriage vows.